Global artificial intelligence as a service (AIaaS) market expected to reach approximately USD 14.71 billion in 2024, growing at a CAGR of 45.2% between 2018 and 2024. Artificial intelligence as a service is offered by the third party as an outsourced service. The service is very much useful for users as it helps them to utilize the advantage of artificial intelligence without investing much. The report covers forecast and analysis for the artificial intelligence as a service market on a global and regional level. The study provides historic data of 2015-2017 along with a forecast from 2018 to 2024 based on revenue (USD Billion). The study includes drivers and restraints for the artificial intelligence as a service market along with the impact they have on the demand over the forecast period. Additionally, the report includes the study of opportunities available in the artificial intelligence as a service market on a global level. This report offers comprehensive coverage on global artificial intelligence as a service market along with, market trends, drivers, and restraints of the artificial intelligence as a service market. This report includes a detailed competitive scenario and the product portfolio of key vendors. To understand the competitive landscape in the market, an analysis of Porter’s Five Forces model for the artificial intelligence as a service market has also been included. The study encompasses a market attractiveness analysis, wherein all segments are benchmarked based on their market size, growth rate, and general attractiveness. This report is prepared using data sourced from in-house databases, secondary and primary research team of industry experts. 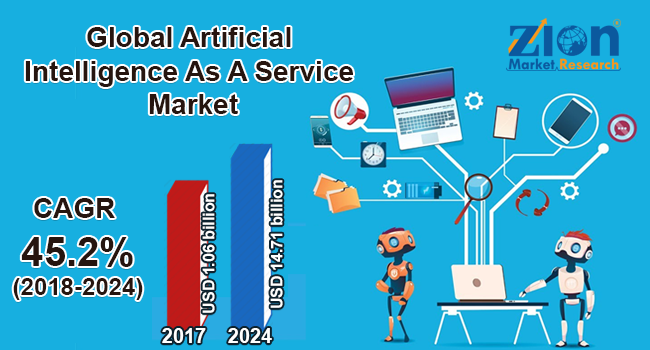 The study provides a decisive view on the artificial intelligence as a service market by segmenting the market based on service type, technology, verticals, and regions. All the segments have been analyzed based on present and future trends and the market is estimated from 2018 to 2024. By service type, the market is divided into software tools and services. Technology wise the artificial intelligence as a service market is segmented into Machine Learning (ML) & Deep Learning, and Natural Language Processing (NLP). On basis of verticals, the market can be bifurcated into BFSI, healthcare & life sciences, retail, telecommunication, government & defense, and others. The regional segmentation includes the current and forecast demand for North America, Europe, Asia Pacific, Latin America, and the Middle East and Africa. The report covers detailed competitive outlook including the market share and company profiles of some of the key participants operating in the global artificial intelligence as a service market include IBM Corp., Google, Amazon Web services, Microsoft, Salesforce, FICO, Baidu, SAS Institute, BigMLl, IRIS Al, Intel, SAP, Rainbird Technologies, Cognitive Scale, and others.